Philadelphia Police have arrested and charged a man in the hit-and-run accident yesterday in the city's Crescentville neighborhood that killed an 8-year-old boy. 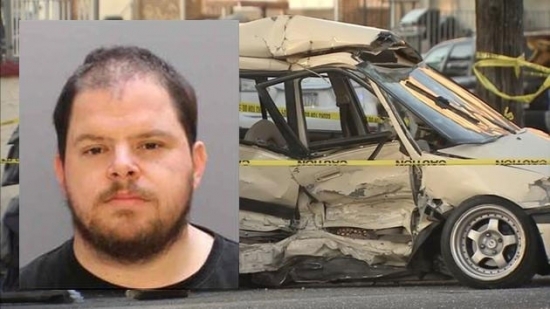 34-year-old Michael Finn is charged with accident involving death, homicide by vehicle, accident-death-no license, and involuntary manslaughter. The crash happened around 2 pm Wednesday at the intersection of Whitaker and Jericho streets. Finn struck the older model Honda Civic as it was making a turn. He got out to check the damage to his car and then fled. The 28-year-old father was taken to Temple University Hospital. The boy was rushed to St. Christopher's Hospital where he was pronounced dead. Witnesses gave police a description and license plate of Finn's Honda Odyssey. They were able to locate him about a mile away. Finn told police he suffered a diabetic incident. Around 800 train passengers were stranded in Center City this morning because of downed lines on the tracks. It happened during the morning rush at about 8:30 a.m. Wires were down between 30th Street Station and Suburban Station causing a shutdown of SEPTA Regional Rail service. Passengers spent up to 90 minutes on the various trains waiting. Media-Elwyn, Trenton, and Airport line trains were affected. Eventually a 'rescue' train was able to pick up the passengers. Delays were felt through the afternoon. A would-be armed robber in West Oak Lane was foiled when the victim pulled his own weapon and shot back early Thursday morning. It happened around 12:10 a.m. on the 6500 block of Beechwood Street. Two neighbors were outside talking when they were approached by a man who pulled a gun and demanded their belongings. One man fled and the other 28-year-old victim initially stood his ground but then fled behind a car. The robber continued to pursue him while holding his gun out. The victim, a securing guard with a license to carry, drew him gun and shot three times. He hit the robber once in the wrist, who then fled to a nearby McDonald's. Police arrested him there and took him to Albert Einstein Medical Center for treatment. The suspect is identified as 22-year-old Osiris Lester. He is charged with robbery, possessing an instrument of crime, assault and recklessly endangering another person. Philadelphia Police Capt. Sekou Kinnebrew says, "He does have a valid permit to carry. We checked that out. He's the victim of a robbery. He did attempt to retreat, taking cover behind a car. But the offender continued to aggress, and (the victim) had to defend himself."